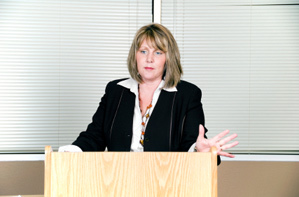 As an experienced presenter you know the need for effective presentation skills. And you know they are essential for all sorts of presentation opportunities. You also know the importance of being prepared for a major presentation…totally familiar with your subject, content and structure. And, of course, you know the value of presentation rehearsal. And knowing all that means that you also want to give your best when you have to give a major presentation. Whether that's PowerPoint or a PowerPoint alternative. And, of course, that can be the difficult part for busy executives. Because good effective presentation practice takes time and effort. Interruptions will always disrupt your presentation flow. Really, that's a problem for any presenter. So, a half-day effective presentation skills refresher gives you the answer. It's a half day of presentation training with your own trainer, one-to-one. You'll have a whole morning or afternoon to work on your presentation skills with someone who can give you the help and encouragement you need. So you can present with confidence. So, an effective presentation skills refresher gives you the time and space to focus on your next key presentation. Perhaps you want to rehearse a PowerPoint or Keynote presentation. Or, you want to craft your presentation's beginning. Maybe you want to discover how to finish your presentation. Alternatively, you could work through the essential structure linking your presentation. Or, possibly, you might want to work on the over-all message of your presentation. The presentation went really well using your techniques & I didn’t um or errr once! The thing is…it's your time and your trainer will help you to make the most of it. Because you'll get invaluable feedback and insight into your presentation, presentation tips and techniques—making you a more confident and effective presenter. Includes: A half day presentation skills session with your own presentation skills trainer. We train at a business-oriented training venue in a city centre or easily accessible location. Or, as an alternative we can always train at your offices. Personal skills training gives you the chance to work on all the key presentation skills that you need for your conference presentation. Therefore, whether you plan to present at a seminar, conference or trade association you will find the PresentPerfectTM half day presentation skills refresher an invaluable option. Please don't hesitate to get in touch for presentation advice. This one-to-one training session–either morning or afternoon–is dedicated to you. So you can practise your presentation techniques without interruption. And, because it's full of best practice tips this effective presentation skills refresher is perfect preparation for a big presentation event. In your skills refresher you will learn to ask the right questions before you give a presentation. Mastering the art of presentation requires practice and rehearsal. So, in your skills refresher you will find out just how important your rehearsal can be. Also.if your presentation is ready, you can practise it during the session. When you have prepared your presentation, practised and become familiar with its content, the assumption might be that you are ready for the podium. But, you still have to prepare for a question and answer session. So, your refresher will also highlight how to get ready. In your effective skills refresher you will find that confidence is the currency of the successful presenter. Because, with confidence you earn the attention and respect of your audience. Using visual imagery is key to effective presenting. Therefore, you can expect your refresher half-day will highlight the power of presenting with images. The opening to your presentation matters. Thus, a good presentation has a good dynamic opening...and a strong conclusion. Your presentation training refresher will show you how to get the most from the opening moments of your presentation. And, importantly, it will show you how to end it. Most presenters will suffer from tension or fear of presentations at some stage in their career. Tackling this in your half-day refresher could well give you that all important career boost. So we will show you how you can expect to enhance your industry profile with planned and prepared presentations. Your half-day skills refresher will always help. 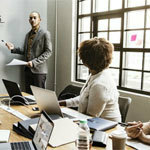 Your presentation skills refresher will show you how to keep the attention of your audience when you present, with the point, turn and talk technique. You will discover the top techniques for the range of presenting opportunities you face. Planning your presentation is crucial. In your presentation skills refresher you will work through the steps you need for presenting success. "When you wish to instruct, be brief; that men's minds take in quickly what you say, learn its lesson, and retain it faithfully. Every word that is unnecessary only pours over the side of a brimming mind."